Priced: $3.99 - $6.99 Rated: - 4 stars out of 5 by 9 reviews. Every home and boat needs No Damp Dehumidifier to soak up humidity. 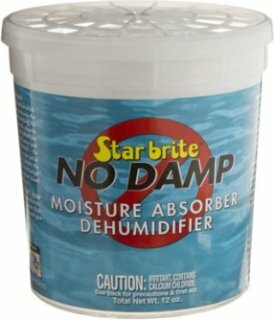 Star Brite’s No Damp Dehumidifier dries air to prevent mildew odor and musty odors. A unique inner basket design increases efficiency and life of the unit. A 12-oz. container treats a 900 cubic foot area. Made in USA . Compared to ordinary household flake formulas, these marine-grade crystals in pellet form absorb more moisture and work longer to reduce humidity and eliminate odors. A tray within the bucket-style container keeps pellets above trapped moisture to dramatically improve performance. 12oz. size covers 900cu.ft. 36oz. container covers 1800cu.ft. I have been using Star Brite's products for over 20 years. I use the slow release in conjuntion with the fast release. At the end of the season I will use the fast release. This hopefully kills the mold/mildew that may be present. If you can see mildew, then there is a lot of it. My boat goes in for storge at the end of October and stays covered till the beginning of May; that's along time. I use one packet when it goes into storage. I keep several packages on the boat. Come mid March as tempertures start to rise, I'll check on the boat and use another package. Our winter air is cold and dry; not the condition that mold/mildew thrive in. In my opinion, the key to mold/mildew is to control it early. It's almost impossible to never have it at some point in time. Boats are naturally around water and the hot summer air contains a lot of moisture. Those with larger boats and air conditioning can keep the air in the cabin dryer than those of us who do not. I use this product during the winter/spring while the boat is in storage. My preference is to fill a couple of trays with roughly 12 lbs of cat litter and pour 2 lbs Star Brite's No Damp on top of each tray. It will aborb a lot of moisture during the late fall. High temps in southern PA in November range from the 70's to 40's. The air is fairly dry during the winter so there is not much moisture to be concerned about. Once March and April arrive this stuff is needed. I normally stop by the boat on a warm March day to add another couple of pounds of the No Damp. That is usally enough to make through mid May when the boat is ready to be used. At this point both containers are saturated with water; almost overflowing. The reason I use it is for mold/mildew control. A boat with dry air is not conducive for mold/mildew. Preventing it is much easier than trying remove it. Used for covered boat outside winter storage. Also used for all season unheated, enclosed, storage garage to remove excess moisture from confinement same as boat. Introduced to product by my son with stated boat. We are a swim school and have a few damp items we hand in the closet. Before mildew has appeared on clothing, but since we put in this product mildew has been a mil-don't. I split this tub into two large buckets in the Fall and it protects my boat interior from excessive moisture until Spring. I purchased one years ago for my boat cabin and it worked great. I just purchased another one for my new RV. IT'S wet in washington. so we need thing's like this to keep the moss down. Cut back on the Mold! Easy to set up but material sometimes gets caked and hardened to basket and hard to get out. Other than that helps keep moisture down in cabin preventing mold growth. Convenient cover to keep from spilling water.